Your Personal Movie Collection Cataloger and Organizer With IMDb Lookup! All My Movies is your Personal Movie Collection Cataloger for Windows PC, and Movie Organizer With IMDb Lookup! Whether you're looking to catalog your collection or track which movies you've watched, All My Movies has the tools you need to begin building your own movie database. This flexible, user-friendly interface makes archiving, organizing, and tracking your movies faster than ever. With access to all the major online movie repositories (TheMovieDB, Amazon, IMDb, etc.) adding your first movie is as simple as typing in the title. AMM will work behind the scenes; automatically gathering information about that movie! Remember the first time you saw a movie at the theater? How about when you bought your first DVD player? Maybe it's the excitement of looking forward to watching a block of your favorite TV show that you've been recording on DVR. While it's different for each of us, there is something that holds true for most of us — movies are fun! After watching hundreds of YouTube videos and subscribing to satellite TV with its 999+ channels, it's easy to forget how magical movies really can be. You'll find that's a thing of the past when you begin using All My Movies. This amazing program will have you viewing your collection in a whole new light. See for yourself what an excellent movie catalog building tool All My Movies can be through our free 30 day trial download. HTML exports are limited, and you won't be able to create a new database with the free version, but you're welcome to work with the sample DB provided. If you like what you see and decide to buy a copy, you can take advantage of one of special offers. 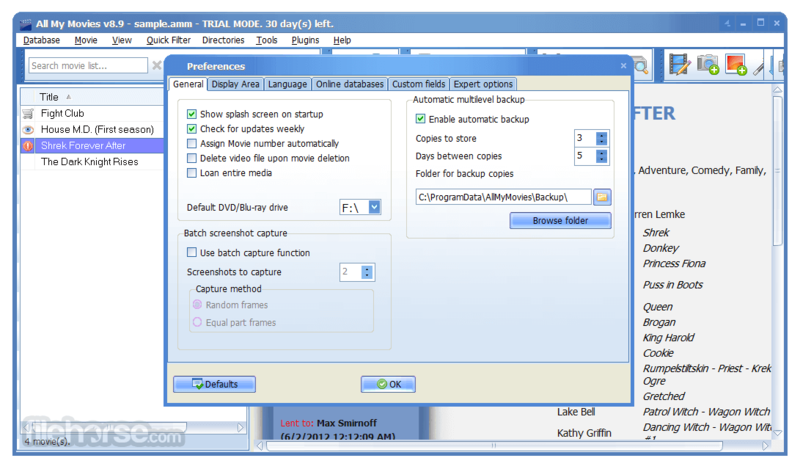 Play movies directly within AMM (can be used as a video playlist).